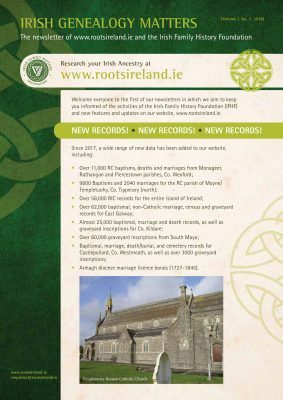 We are very pleased to announce the publication of the first issue of our new newsletter, entitled Irish Genealogy Matters. In it, we aim to keep our clients and friends abreast of all the latest updates to our website, www.rootsireland.ie, news from our member centres and other facts and information for all of those interested in genealogy. Click on the link below to read our newsletter. We hope you enjoy!